I have gathered you here as representatives of the many people involved in development of the Nintendo 3DS XL system. Thank you for coming. First, please introduce yourselves, mentioning what you worked on. Let’s start with Koshiishi-san. Okay. 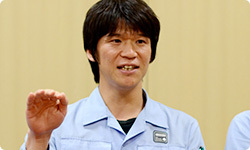 I’m Koshiishi from the Mechanical Design Group. 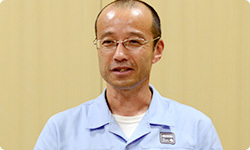 I was project leader for Nintendo 3DS XL and leader of mechanical design. 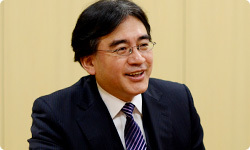 I talked to you about the Nintendo 3DS system as well. Here at the start, could you please explain what kind of work mechanical design is? Ok, sure. Mechanical design is optimally arranging and packing in all the many parts within the system. We design in co-operation with the team designing the exterior. You’re a specialist in that area, and you were project leader this time, so you filled two roles. Yes, that’s right. Thanks for inviting me here today. 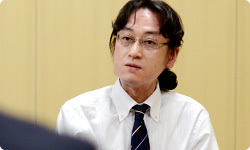 I’m Tanaka from the Project Management Group. When this project first started, I was in the System Software Development Group, and in that capacity, I became in charge of organising the software elements. 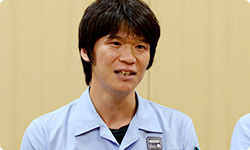 I’m Murakami from the Mechanical Design Group. As someone working on the device itself, I was in charge of LCD elements, the Touch Screen and the screen cover. I’m also the one who verifies the mechanical strength. 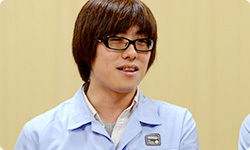 I’m Fujita, also in the Mechanical Design Group. Together with Murakami-san and Miyatake-san in the Design Group, I was responsible for casing design. I also pulled together the sound and got to adjust the speakers. I’m Miyatake from the Design Group. At the start of the project, every member of the group participated on the hardware design including myself, and the latter half was when I really got hands-on. 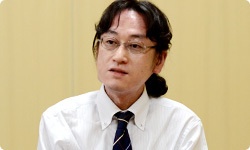 You also discussed Nintendo 3DS with me, and you played a central role in the design of Nintendo 3DS XL. In the end, yes. My work held greater weight this time. To start off, I’d like to go back to how the Nintendo 3DS XL project began. Koshiishi-san, could you start by talking about that? Yes. First, we made a working model with big LCDs. By working model, you mean a version that functions, but before any thought has been given to design and structure. Yes. I say “working model” but we really only connected big LCDs to the Nintendo 3DS circuitry. Was the size of that LCD like it is now? Yes. The 4.88-inch upper screen was pretty much decided in the working model stage. That’s 90% bigger than the size of the original Nintendo 3DS system’s LCD. In some ways, that was bigger than you had imagined at the time, wasn’t it? We wanted an impactful size for showing off the 3D, so we aimed for that from the very beginning. Even now, every time I see the actual LCD, I feel, “That’s so huge!” (laughs) How did you decide on that size? It was simply a balance between cost and size. 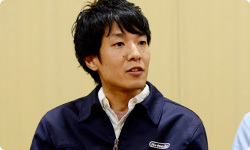 It might be better for Murakami-san, who was in charge of the LCD, to talk about that. As Koshiishi-san said, when it came to the LCD, size generally equals cost - it has a direct effect - but that doesn’t always mean that bigger is simply more expensive. The cost gradually changes depending on what size you cut from a single giant sheet of glass called the mother glass. But at that size, a product under 20,000 yen had been impossible just some time ago. The biggest factor regarding the LCD was that we were able to count on lowering the cost due to mass production. A co-operating manufacturer let us use their special factory facilities for large-screen liquid-crystal televisions. It was the first time that Nintendo had attempted such a thing. But the larger LCD came with a mountain of other challenges, didn’t it? The first thing that I thought of was how a larger LCD would increase the area that the backlight needed to hit, thereby increasing power consumption. The casing is larger, so you might be able to handle it by increasing battery capacity, but you can’t just simply make it heavy either. The backlight uses the most power, so it would have a large effect on battery life. Naturally, our first debate was over whether it was all right the way it was. We checked out various methods and technologies and found a new, as-yet-unestablished, technology for decreasing power consumption. What exactly was that like? It’s a technology for holding down power consumption that, compared to Nintendo 3DS, improves the use efficiency of light from the backlight. When you view 3D images on Nintendo 3DS, the liquid-crystal barrier blocks the images for the left and right eyes from each other, so the efficiency of the light is halved. You thought that improving that would also save power. Right. Our parts maker developed a new method for improving transmittance (the amount of light emitted), and in the end we were able to adopt it. It’s a new technology that didn’t exist when we made Nintendo 3DS, so I would imagine that dragged on until the last moment. Yes. We made fine adjustments up to the last second. Usually, you should determine the LCD specifications early on, but they actually didn’t solidify until the end of last year. But that time spent solved the two problems of screen brightness and battery life, so it really paid off. With regard to the LCD, many customers appear to be worried, asking questions like, “If the screen is bigger, won’t the dots stand out?” and, “Will the screen get blurry?” As a developer, what do you think about that? Apparently I have incredible eyesight, so if you look at it with eyes like mine, you can tell. (laughs) But for normal play, I don’t think anyone will be able to sense anything awkward. The dots are indeed smaller than on the Nintendo DSi XL1 system. When I played it, I wasn’t bothered by anything at all. 1Nintendo DSi XL: A handheld game system with the same features as the Nintendo DSi system, but with larger screens. It was first released in Japan in November 2009 as the Nintendo DSi LL. To get a bit technical, it is thought that you need the screen to have at least 100 ppi2 to view good 3D images, and I’ve set it as a goal. What’s more, the Nintendo 3DS XL system’s attraction as a product is that it’s bigger than Nintendo 3DS and shows 3D graphics with impact - and when it comes to that, it’s just fine. 2ppi: pixels per inch. This is used as a measurement of display density for graphics software and LCDs.